On the whole, I'd much rather be outside today, gardening or kayaking or looking for mushrooms, but I'm stuck in my office. This was made much more tolerable by a colleague's email notifying me that The Royal Society has opened its online archives containing every paper published in the Royal Society journals from 1665 to the present day. Access to the archives is free to the public for the next two months. So I've just spent a pleasant hour reading a letter of Mr. Isaac Newton , Professor of the Mathematicks in the University of Cambridge; Containing His New Theory about Light and Colors , published in 1671. Too cool! He held a prism up to a beam of light and observed the shape of the refracted colors, an activity that never failed to delight my daughters when they were toddlers. "It was at firft a very pleafing divertifement, to view the vivid and intenfe colours produced thereby; but after a while applying my felf to confider them more circumfpectly, I became furprifed to fee them in an oblong form; which according to the received laws of refraction, I expected fhould have been circular." Uh, yeah, I guess we never got quite that far in our obfervations. Darn, why couldn't they have waited until January to open the archives to the public! Petunia's Gardener asked what other folks were planting in their winter gardens. I started to leave a comment but quickly recognized a blog-hijacking-in-progress, so I retreated to my own space where I can babble on ad infinitum. Because the nights are so cool on Tiger Mountain, some portion of my winter garden gets sown in the springtime. Sown in April, but not yet ready for harvest, are brussel sprouts and parsnips. The brussel sprouts are just forming and should be ready by November. They'll stand all winter as I pick off the largest ones from each stalk and leave the rest to grow. Ready for harvest, but left for the cooler weather are winter squash (delicata and butternut varieties) and kale. 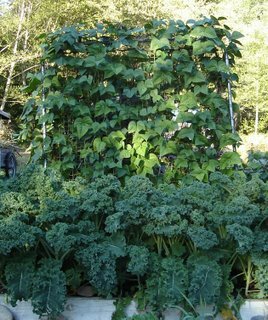 Kale seems to need at least a light frost to sweeten up and the winter squash keeps so well, I like to wait until other things are finished before bringing it in to cook. Things we've been enjoying all along, and will continue to enjoy for at least the first part of winter are carrots, beets, and swiss chard. Last year I left beets in the ground to harvest until they started new top growth in early spring. I sow lettuces continously throughout the summer and right now I have baby romaine, arugula, purslane, and a crinkly green leaf lettuce. Lettuce seems to survive the worst winter weather here, including getting snowed on, but it gets so beat up outside that it's not very appetizing in a salad. My outside lettuce is under a slight overhang, but I grow most of my winter lettuces inside the greenhouse. In early August I planted out new seedlings of sprouting broccoli. This is a new one for me, inspired by the Allotment Lady's success last year. The purple sprouting variety is a true biennial. It won't begin producing florets until April or May of next year. Another variety, Rudolph, is claimed to produce sprouts in time for Christmas. I'm not holding my breath on that one. I do have about a half dozen Rudolph plants started inside the greenhouse, but they are actually not as far along as the ones growing outside, owing to either flea beetles or a brassica-loving mouse having stripped the leaves down. In October I'll plant garlic. Last year was the first time I've tried growing garlic (or rather, the first time I did it correctly instead of trying to grow it in the springtime from sprouted cloves from the pantry) and it was a rousing success. I got a nice head of garlic from each clove I planted, the presence of the garlic seemed to have discouraged all the burrowing rodents from that bed, and absolutely no effort on my part after planting. Inside the greenhouse I've started some more swiss chard and kale. When the tomatoes, peppers, eggplants, and melons are done producing, I'll put in more leafy greens, both for salads and for braising--chicories, mustard greens, tatsoi, mizuna, and arugula. I'm thinking I might try to get some more carrots growing under cover as well, maybe the Thumbelina variety. The greenhouse is unheated, so it's really more like a walk-in cold frame. During our recent cold snap it got down to 44 F 4 feet above ground, and 48 F at the soil level. So, that's my winter garden. I'd love to learn what other people are growing and/or wintering over. Reading about Robin Andrea's adventures in misanthropic photoshopping reminded me of one of my favorite photos, taken just after dawn on August 1, 2005. My daughter and I had expected this site to be deserted at that time, or possibly occupied by a group of Lughnasadh celebrants, but it was crawling with a busload of tourists. As the sun rose, I did my best to capture the stones alone, but every time I clicked the shutter another fleece-clad person would have popped out into view. Time was when my garden had to be all tidy beds and made-to-purpose trellises. These days when my day job takes nearly all my waking hours, I find myself using whatever is at hand. 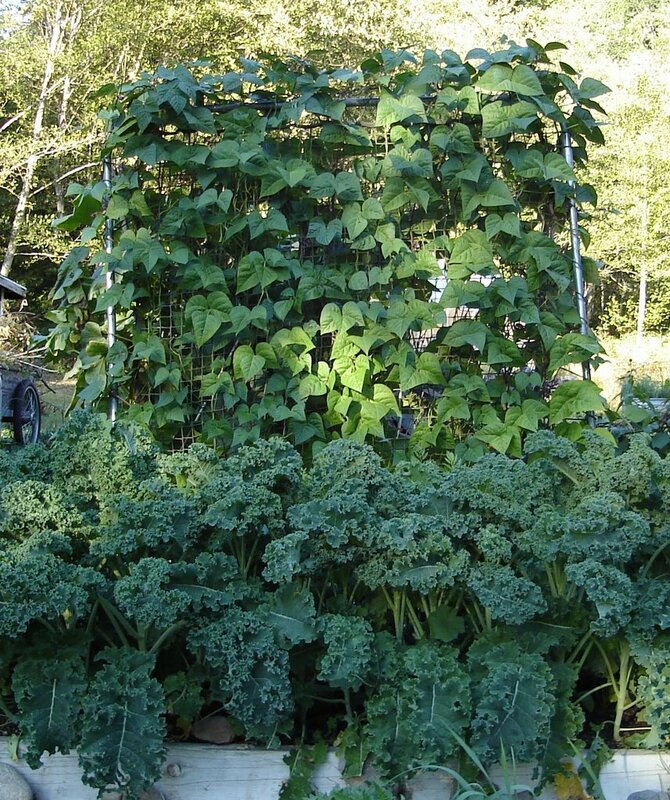 Above: pole beans and kale. The trellis is an old pitchback that my daughters used to use to sharpen their soccer and lacrosse skills. Below: Growing winter squash in the compost bin. 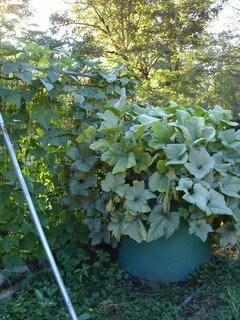 The bin, which is about 4 feet tall, was full of compost that wasn't quite ready to use, so I added a couple shovelsful of soil and planted my squash in it. They probably could have gone all summer without my watering them. Ripe melons on chilly Tiger Mountain! I ended up with about a dozen melons, ranging from 3-4 pounds each, from 6 plants. Well worth the effort. First Sunday in September, which means it's the moment of truth for the contestants in Dr. Charles' tomato competition. And thank you, Doctor, for giving so many tomato-philes an opportunity to strut our stuff online. 1. Talent. It was not enough to be a pretty tomato. If you didn't taste good you weren't going to finals. That ruled out 'Health Kick'. 'Prudens Purple' and 'Brandywine'. Nice pedigree, but you didn't earn your keep this year. Note to Carlito: no animals were harmed in the production of these tomatoes, except for the ones the spiders caught and ate. 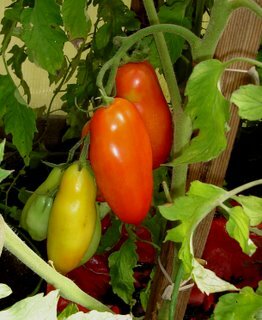 And now, the contestant from Tiger Mountain, Super San Marzano. Modest-sized plants festooned with clusters of 5, 6, even 7 luscious fruits, some weighing as much as 125 grams. Lovely to behold, and to hold. 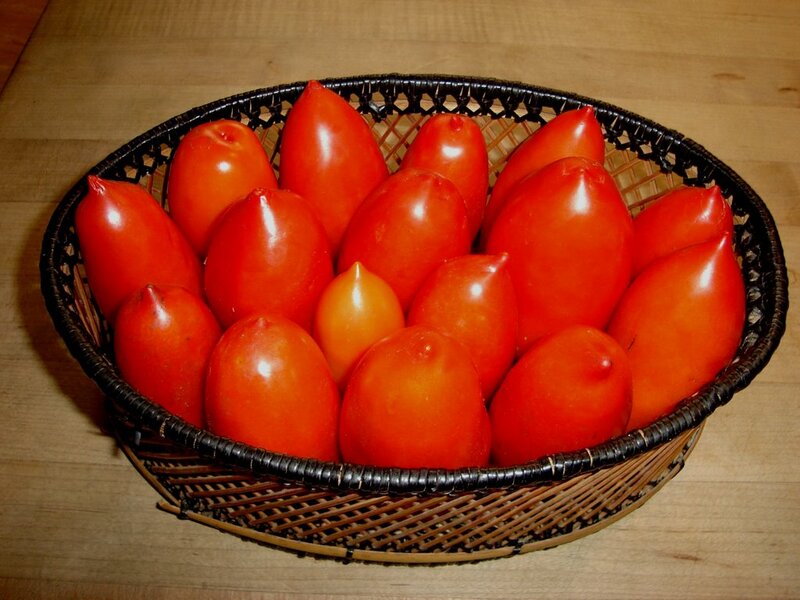 A wonderful cooking tomato--sauce thickens up to almost a jam-like texture after a brief simmer. I love these guys!